BATTERIE combines improvised live drums, synthesizers, sampling, looping, and electronics that interact with visual projections in a unique live solo show that pushes the boundaries of what a solo performer can do. BATTERIE performs instrumental electronica inspired by IDM, electro, chip tune, experimental rock and post rave music genres. Some highlights have been supporting New York art rock band Gang Gang Dance at the Sydney Opera House, opening for cult Japanese group CIBO MATTO, performing at ART BAR at The Museum Of Contemporary Art and most recently playing SQUARE SOUNDS festival in Melbourne, Australia’s only Chip tune, retro tech music festival and SUBSONIC dance music festival. Over the last few years BATTERIE has been busily composing music for indie games including : OTTTD, One More Dash, PLATO, One More Jump, Thumb Drift and One More Line. The games he has worked on have been downloaded more that 24 Million times . The music is available on Apple music, Spotify, Soundcloud, BandCamp and more. 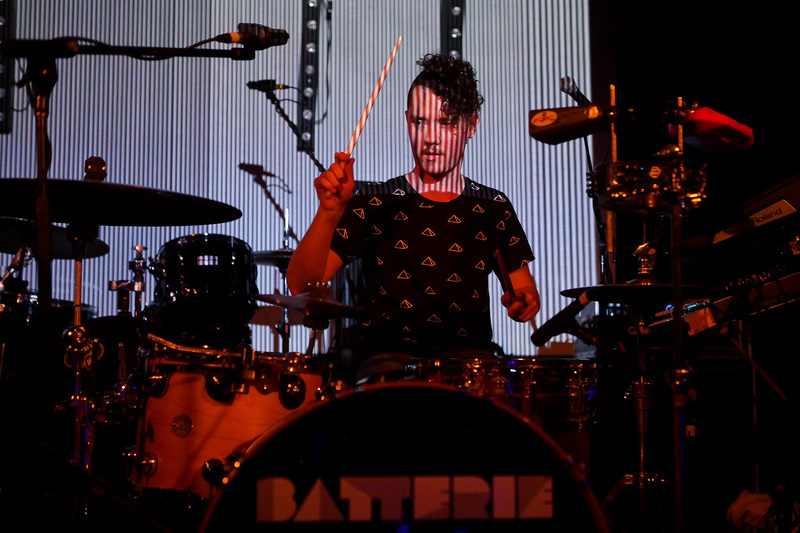 BATTERIE was a guest speaker presenting his game soundtrack work at the APRA High Score game music conference in May 2017, GCAP 2017 gaming conference in Melbourne and APRA The Melbourne Sessions July 2018. In other musical guises Jared was the winner of TropScore 2013, he performed his winning film score live to picture at TROPFEST to an audience of 80,000 people in the Domain. He has also composed music for fashion films, performance art groups, TV commercials, 360 videos, and even a nature documentary for National Geographic Channel. He has been nominated for 2 ARIA awards as a member of Cinematic art pop group CODA who have played Vivid Sydney, Woodford Folk festival, The Big Day Out and more. Jared was a founding member of Sydney post rock band PROP whose members went on to form The Presets and Boy & Bear. Prop supported Tortoise & Sonic Youth. Their album ‘Small Craft Rough Sea’ is available on Spotify and Apple Music. As a collaborating musician he has worked with : Daniel Johns (Silverchair), members of The Presets, Nick Littlemore (Empire of the Sun), Luke Steele, Hugo Race (Nick Cave) Jake Stone (Bluejuice), Jane Tyrell (The Herd), Lenka, Jono Mar (Jagwar Ma), Touch Sensitive, Grafton Primary, PROP, CODA, and more.